The leaves are a’changing and the cool winds have begun to blow. 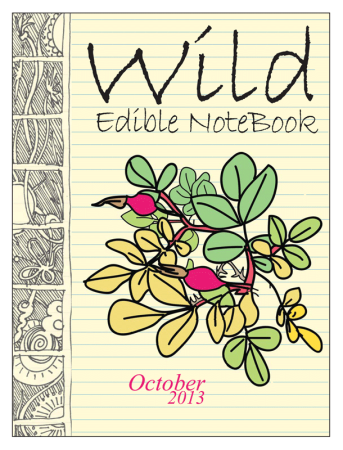 Still, foraging season continues into October, and with it, a new-and-improved Wild Edible Notebook blows into town. October 2013 brings many exciting changes to the Notebook, including a new look-and-feel with an improved cover and 2-column layout, designed to look better overall and also to improve viewing on smart phone devices. And, October 2013 and all future issues are available for iPad and iPhone in the Apple Newsstand! Improvements to the PDF versions include a wider screen reading PDF, a new 2-sided print-and-fold PDF designed to print on legal (8.5” x 14”) paper, and an Android-formatted PDF. The October 2013 issue dives deep into rosehips, the fruits that develop at the bases of wild and domesticated roses. Not only are rosehips an excellent source of vitamin C, but they also lend themselves to numerous culinary preparations. Next is the tale of my mission to dry dandelion leaves for winter, inspired by the idea to make a nutritious green powder described by Colorado forager Katrina Blair of Turtle Lake Refuge. This edition also includes a review of Practical Herbs, a medicinal plant how-to by renowned Finland-based herbalist Henriette Kress, which will soon be followed by the book’s sequel, Practical Herbs 2. There are a handful of rosehip recipes by yours truly as well as my Colorado-based partner in crime, Butter. There’s a rosehip coloring page on the print version, and an announcement about the 3rd Annual Florida Herbal Conference, coming up in February/March of 2014, in all of them. The procedure for downloading the Wild Edible Notebook has changed. Please visit the Wild Edible Notebook page for information on subscribing to the iPad/iPhone or PDF versions for $1.99/month. Your support makes the continued development of this publication possible, both on the content and technical sides. To download a free issue of the Wild Edible Notebook and stay abreast of future developments, please join the email list by filling out your info at the very bottom of the website. Thanks!